This catchment is located in the northern part of the Cheshire Basin (Figure 5.1). This basin was formed in late Permian times with the main period of extension during the Triassic. Subsequent removal of Jurassic and Cretaceous strata have allowed the establishment of freshwater aquifers within the Triassic strata, in the Helsby and Wilmslow Sandstone Formations of the Sherwood Sandstone Group. Parts of the area are confined by the low permeability Tarporley Siltstone Formation of the Mercia Mudstone Group, but the Sherwood Sandstone outcrops at the surface in the remainder of the catchment. Superficial deposits, predominantly fluvio-glacial sands and gravels, can form a localised secondary aquifer. 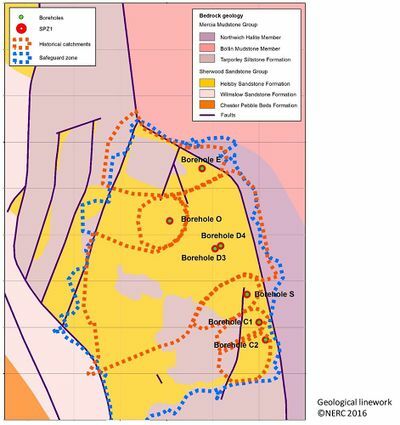 Figure 5.1 Locations of the study boreholes and bedrock geology of the catchment. In this case study we focus on Boreholes D3 and D4. These boreholes have long and relatively complete datasets of nitrate concentration which show significant increases over the past 25 years. There are a number of other sources in the group which have been excluded from this case study. Borehole E and Borehole O show similar increasing trends to the D sources and are not reported here to avoid repetition. 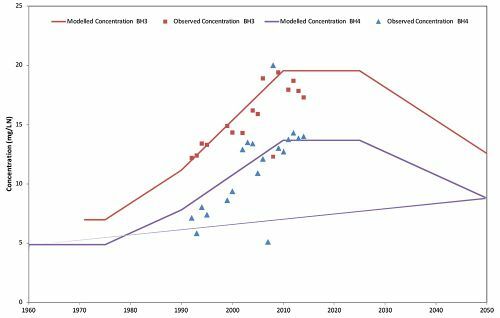 The Borehole C and Borehole s sources currently show decreasing trends in nitrate concentrations which are challenging to model. The primary source of nitrate in the Borehole D 3/4 catchment is agriculture. For the historical D catchment, the 2000 CORINE dataset indicates that 60% of the catchment is made up of arable and pasture land. The historical catchment is within a Nitrate Vulnerable Zone. Nitrate concentrations at Boreholes D3 and D4 have been recorded since the 1950s. Observed nitrate concentrations are presented in Figure 5.2. The Environment Agency have provided BGS with data from 1990 onwards. Whilst this captures the most rapid rises in concentrations, historic rises in concentrations in the 1950s to 1990s are not present. Figure 5.2 Observed and existing modelled nitrate concentrations at Boreholes D3 and D4. Reproduced by permission of the Environment Agency. The Sherwood Sandstone is at outcrop in the historic catchment and forms the principal aquifer in the area. Faults to the east and the north of the area are considered as boundaries to groundwater flow. Boreholes D3 and D4 are screened to different depths and consequently receive different proportions of shallow and deep groundwater. There is also evidence that varying abstraction in the shallow borehole affects concentrations in the deep borehole. The thickness of the unsaturated zone is estimated to be 40 to 50 metres close to these boreholes. A soil model derives annual nitrate concentration at the base of the soil zone. National annual fertiliser use data from DEFRA are scaled to NEAP-N data for the historic borehole catchments and diluted by a specified infiltration rate. The outputs from the soil model are then lagged based on a travel time delay and diluted by unpolluted groundwater to derive concentrations at the borehole. Figure 5.2 shows the outputs of this modelling work and illustrates that the overall general trend of increases in nitrate concentrations are reasonably well replicated. Nitrate concentrations at the case study boreholes have been modelling using outputs from the BGS nitrate time bomb model linked to a simple saturated zone borehole dilution model. This approach has been demonstrated by Wang et al. (2013) for the Permo-Triassic sandstones of the Eden Valley, Cumbria and has been detailed previously in the briefing report (Stuart et al., 2016). Nitrate loadings at the base of the soil zone are derived from an interpolated nitrate input function based on the original BGS nitrate input function and NEAP-N data for the historic borehole catchment. Nitrate concentrations at the water table are derived from estimates of historic long term average recharge and unsaturated zone travel time from the original nitrate timebomb model. Water table concentrations are then lagged to account for saturated zone travel time and reduced by a factor to account for dilution by deep nitrate-low groundwater. Figure 5.3 shows the result of the BGS modelling for the case study sources. In general, the model replicates the observed nitrate concentrations well in terms of trends and absolute levels for both boreholes (Borehole 3–R2 = 0.62, Nash and Sutcliffe Efficiency = 0.35, Borehole 4–R2 = 0.84, Nash and Sutcliffe Efficiency = 0.76). Increases in nitrate concentrations are well replicated by the model. The decline after 2020 is driven by the shape of the NIF used. Figure 5.3 Observed and modelled (BGS) nitrate concentrations at Boreholes D3 and D4. The nitrate timebomb model predicts an unsaturated zone travel time of approximately 30 years. Allowing for some additional lag in the saturated zone, this generally agrees with total travel time estimates derived by the existing modelling of 36 years. Using the scaled NEAP-N nitrate input function with long term average recharge results in no dilution required for borehole 3 and limited dilution (30%) required for borehole 4. This generally agrees with work undertaken by the utility which suggests that dilution by unpolluted groundwater is limited for these sources. This modelling work benchmarks the BGS approach with other similar approaches. The key difference in the approaches used to estimate the unsaturated zone travel time. Whereas the existing modelling estimates the travel time during calibration, we use previously existing estimates of travel time based on the national scale nitrate timebomb model. The fact that the travel times predicted from the national scale model agree with those estimated in model calibration suggests that using the BGS nitrate timebomb model with local scale NEAP-N data would be a useful first step in assessing the significance of unsaturated zone N storage in NVZ designations. These group of sources abstract water from unconfined Permo-Triassic Sandstones of Northwest England. The Boreholes D3 and D4 show rising nitrate trends which are attributed to agriculture. 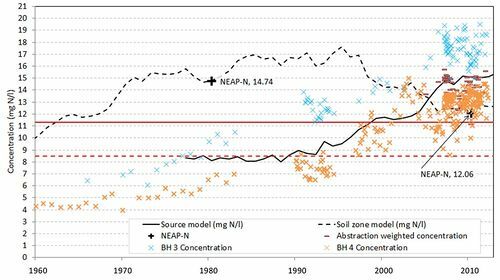 The observed nitrate trends have been simulated for the Environment Agency using a trend model which links nitrate at the base of the soil zone derived from NEAP-N and national DEFRA fertilizer use statistics with a simple lag and dilution model. BGS linked outputs from the national scale nitrate timebomb which estimates the unsaturated zone travel time a priori with a simple saturated zone model. Both approaches show reasonable agreement with the observed nitrate concentration data at the D boreholes. The primary implication of this case study is the benchmarking of the BGS modelling approach with other approaches used to model groundwater nitrate concentrations. The BGS modelling approach has been demonstrated to produce similar outputs to simple lag and dilution models. However, the key difference between the BGS model and other approaches is a priori knowledge of the unsaturated zone travel time. Given the ability of the BGS NTB approach to model the observed trends at this case study, it is suggested that outputs from the NTB model could be used in other locations where public water supply boreholes show long term rises in nitrate concentrations.